Tired of teaching genetic concepts with the same old pink petunias and Mendel s peas? With Garden Genetics, you can present core content in ways that are fun for students and fresh for you. This two-part set a teacher edition and companion student edition is adaptable to biology students at all levels, including AP. It uses a series of activities and inquiry-based experiments with familiar foods to teach genetics while helping students make connections to ecology, evolution, plant biology, and even social science. 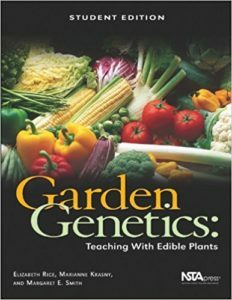 What makes Garden Genetics unique is its emphasis on modern food-plant-based situations. For example, to learn about Punnett squares, students taste variations in bitterness in cucumber seedlings and then design experiments investigating the surprising role that bitterness plays in protecting plants from insects. To learn about plant breeding, students re-enact a trial in which farmers sued seed companies to compensate for $1 billion in U.S. corn crop losses caused by genetic uniformity. Garden Genetics is designed to be flexible. You can use each chapter as a stand-alone unit, or teach the book as a whole. Activities range from guided worksheets to open-ended inquiry. Most important, the innovative content emphasizes the problem-solving skills demanded in today s cutting-edge science classes.